Of the many books written about the Battle of Gettysburg, none has included selections from the collected memoirs of the 238 chaplains, North and South, who were present at the battle—until now. Because chaplains were considered noncombatants, most, with the exception of Father William Corby of the Irish Brigade, were largely ignored. This unique study has brought to light many of the observations of clergymen, Protestant, Catholic, and Jewish, who accompanied their regiments wherever they marched, camped, or fought. Some of the memoirs have never been published, others unnoticed for a century. Because this is the first book to approach the Battle of Gettysburg from this perspective, rosters of Union and Confederate chaplains reportedly present at the battle are also included. To establish reference points for the chaplains’ memoirs, they have been placed in the context of the three-day battle itself, a bloody conflict Father James Sheeran of the 14th Louisiana Infantry characterized as a time when he could not have been more frightened “Had Hell itself broken its boundaries.” Chaplain Randolph McKim of the 2nd Virginia Cavalry thought that on the firing line he had nothing to do but sit on his horse and be shot at. After the battle was over, however, chaplains became very busy. They helped bury the dead and comfort 21,000 wounded soldiers. The chaplains themselves did not escape injury. Four chaplains had been killed, wounded, or injured and eighteen captured to be detained in prisons. This is their story in their own words. In his new book, John W. Brinsfield, Jr. has given everyone--from the casual fan of the Civil War to its most ardent scholar--a very insightful look into the roles of the key participants in the Battle of Gettysburg. He distills the complexity of those three fateful days into an overview of those who were on the field of battle, those who were behind its lines, and those who were left in its aftermath. Of special note is his thoughtful treatment of the mindsets of the front line generals, of the true American pathos of Pickett’s charge, and to the role of surgeons and chaplains at the battle--all the while still giving his reader a global view of the three days of carnage at the small Pennsylvania town. This book is a must for any student of the Battle of Gettysburg or the Civil War and will no doubt join the classic tomes by Harry Pfanz, Edward Coddington, Michael Shaara, Kent Masterson Brown, Stephen Sears, Carol Reardon, and others on this most famous battle in all of American history. The greater sustainer of soldier morals in the Civil War was faith in God. Nowhere was that devotion more tested than in the three-day bloodbath at Gettysburg. In this unique, well-researched narrative, John W. Brinsfield, Jr. concentrates on the chaplains pledged to display the love of God in an atmosphere of hatred and death. This unique study of the Civil War’s most famous battle stands alone for content, humanness, and abiding faith. 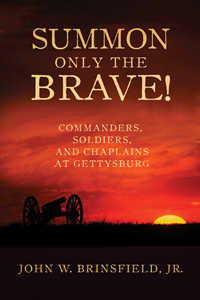 In SUMMON ONLY THE BRAVE!, John W. Brinsfield, Jr. interweaves a high-level view of the Gettysburg campaign with outstanding firsthand accounts from the Union and Confederate chaplains. The voices of the chaplains along with those of surgeons and nurses tell a very human story and offer a new and fascinating perspective on this greatest of all Civil War battles. An excellent read. Interesting, entertaining, and informative. A valuable and original contribution to the history of the Battle of Gettysburg from a perspective most certainly unfamiliar to a majority of readers.